Make the bacon straw: Roll up some tin foil into a dowel and wrap a piece of bacon around it. To properly do this, place the bacon onto a cutting board and place the foil stick at a 45°F angle touching one end of the bacon. Roll the foil wrapping the bacon around it as you go, being careful that the bacon slightly overlaps itself with each revolution. In the end, the bacon should be tightly wrapped like a ribbon. Lightly coat the bacon with brown sugar. Bake in the oven for about 15-20 minutes at 325°F until crisp. To take the bacon off the foil, twist the ends of the foil to thin it, and slowly spin it out of the bacon. Cut the ends off the bacon to make it form a more perfect straw. There will be areas where the bacon isn't fully sealed, but it should still work ok.
Make the drink by mixing the rum and cola. Add a scoop of ice cream and stick in the straw. Serve. Drinking out of a bacon straw is like seeing the world through rose-colored glasses. Everything tastes better. Just enough of that salty smoky bacon flavor rubs off the straw and into the beverage you happen to be enjoying. In this case, that beverage is a rum and cola float, so the bacon straw is only enhancing an already delicious concoction. 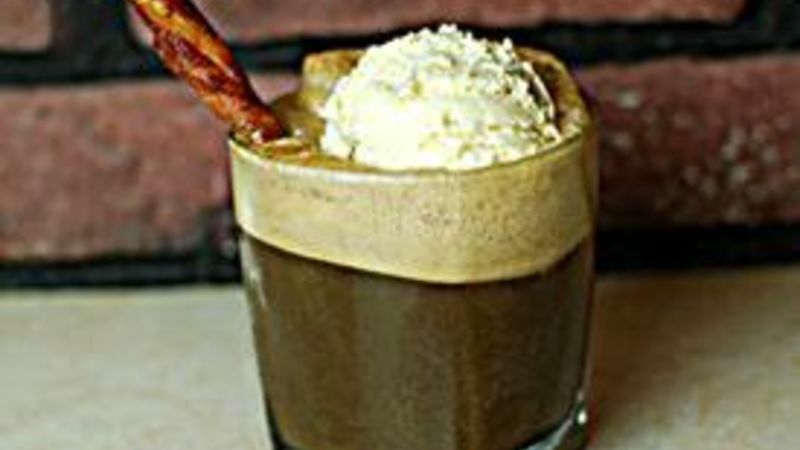 To make the unique drinking device for these Rum and Cola Floats with Bacon Straws, you wrap a piece of bacon around a stick made of tin foil, and bake it at a low temperature until it fully hardens and crisps up. First, wrap the bacon around a piece of foil. This picture is a little misleading, because you actually need to wrap it at more of an angle and allow the bacon to overlap with each layer. After you roll it up nice and tight, give it a light dusting with brown sugar. When it comes out of the oven, you need to gently twist to get the foil out from inside the bacon. Finally, make your rum and cola float. If this isn’t a manly drink, I don’t know what is. Nothing like a bacon straw to help keep foam out of your Movember mustache. Dan Whalen would drink anything out of a bacon straw. He has been blogging for over 4 years at The Food in my Beard; check Dan's Tablespoon profile often to try his recipes with creative international spins!